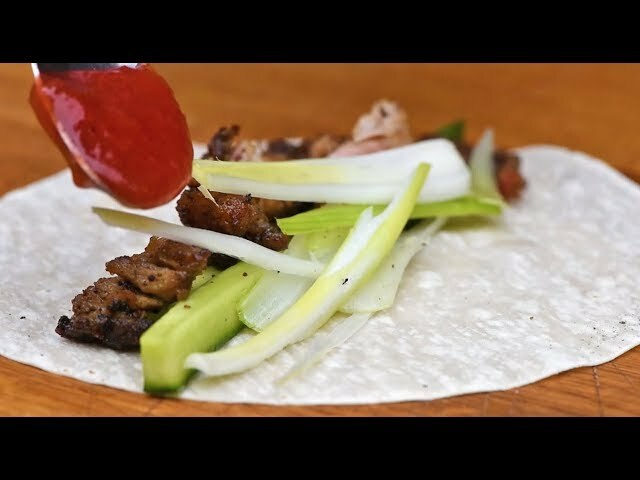 BBQ Shredded Duck & Fire Roasted Plum SauceWhip up these super tasty fire roasted plum sauce and shredded BBQ duck wraps, great as a cheaper and homemade alternative for Chinese takeaway lovers! Bring the flavours of your favourite Chinese dishes home with this recipe for BBQ shredded duck with fire roasted plum sauce! This recipe is great for sharing; serve up as an alternative to the Friday night takeaway and watch the extra pennies pile up as you save. Pop them onto the grill to cook very slowly over a medium-low heat for 50 minutes, until the meat is tender with a crisp skin, turning often. Sprinkle with caster sugar & mix with tablespoon. Grill for 2 minutes on each side, or until slightly charred. When lightly grilled, place the plums in a saucepan add in star anise and cook until sticky. Take a pancake and layer with cucumber, spring onions, duck and plum sauce. Roll up tightly and enjoy!